Description :- Jeweler's anvils are made from cast steel. 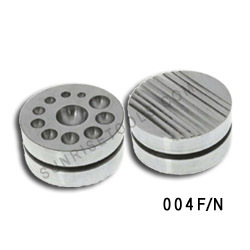 These Best quality anvils are used for repairing, shaping, forming and many others jewelry making works. 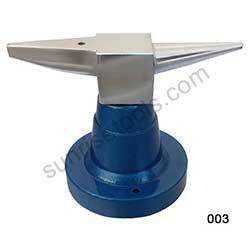 Description :- This anvil has doubled horn and used for flattening & shaping purpose. Its well polished around and having flat horns with a hole on top for riveting. Made from hardened steel. 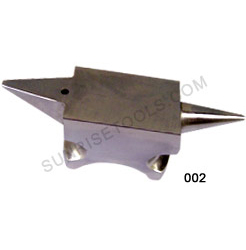 Description :- This round base anvil is made from high quality steel and has detachable round base. Easy to use. 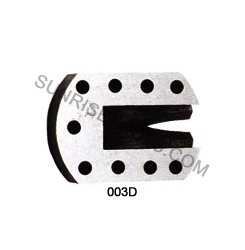 Description :- This round base anvil has flat horns and well polished around. 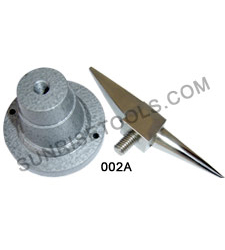 This well designed Anvil is best for shaping and flattening jewelries with a hole on top for riveting. 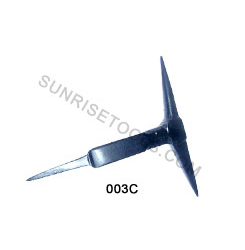 Description :- This anvil comes with heavy round base (approx. 3kg) and has flat horns. 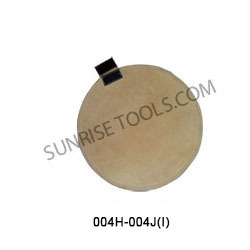 Commonly used for shaping flattening etc. It's well polished and has great stability. 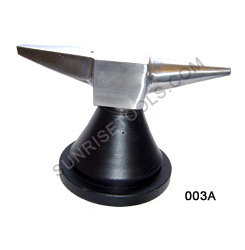 Description :- This Superior quality anvil horn is made from high quality steel and is used for flattening and shaping. A must have tool for jewelers. 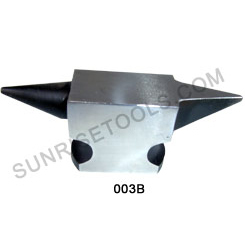 Description :- This stake shape ( T-type ) anvil is commonly used for flattening, shaping, small conical and rectangular work. Made from superior cast steel. 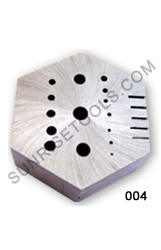 Description :- This best quality hexagonal anvil is used as a base for riveting, staking and drilling small parts. It is large with 15 holes and 5 slots. 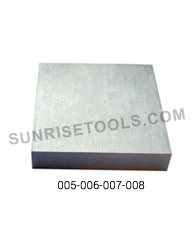 Description :- This rubber block is used for hammering, filing, and many other purpose uses. 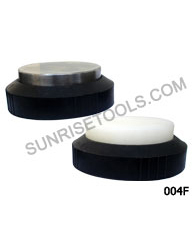 Also used to remove dents and straighten metals without the fear of scratching or distorting. Made from superior quality rubber which provides excellent surface and extremely handy on the bench. 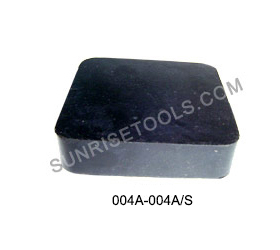 004A Rubber bench block 4" x 4" x 1"
004A/S Rubber bench block 2" x 2" x 3/4"
Description :- This bench block is fixed on wooden base makes ease of work. Made from superior quality material and durable. 4" x 4" x 1¼"
Description :- Leather Sand bags are a useful tool for gently moving metal. Place the metal being shaped on the sandbag and strike the metal with a hammer or nylon forming hammer to shape or smooth the metal. Very useful for repair work when removing dents and imperfections. 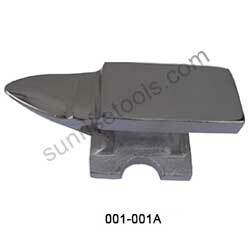 Description :- This Anvil Has nylon and hardened steel faces. Simply press out from base and reverse. Hard neoprene non-slip base provides secure positioning and absorbs light to heavy hammer action. 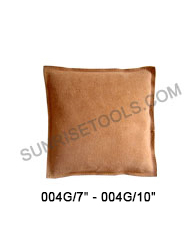 004G Sand Bag Square 7"
004G/10" Sand Bag Square 10"
004H Sand bag without sand 12"
004i Sand bag without sand 18"
004J Sand bag without sand 24"
Description :- High quality steel is used for making steel bench blocks, ground smooth making them an ideal surface for forging, texturing, stamping etc. 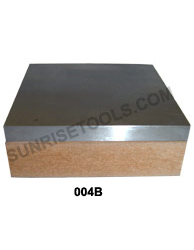 005 Bench block, steel 2"x2"x 3/4"
006 2. 1/2 " x 2. 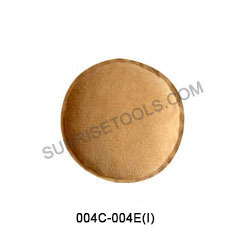 1/2" x 3/4"
007 3" x 3" x 3/4"
008 4" x 4" x 3/4"